The Inspiron One all-in-one desktop has a full HD 23-inch LED-backlit LCD and runs on an optional quad-core processor is meant to go both against the iMac and HP's TouchSmart line with a widescreen color display supports 1080p, multi-touch display centers on a new touch front end, Interface dubbed Dell Stage touchscreen UI for Quick access. Inspiron One is a sleek desktop multimedia entertainment powerhouse, packs Wi-Fi, Webcam, and optical DVD drive that can be upgraded to Blu-ray Combo, drive inside its sleek body. AMD Athlon II X4 processor with 45W TDP rating, up to 8GB DDR3 1333MHz memory, up to 1TB SATA HDD storage, and ATI Mobility Radeon HD 540 graphics card with 1GB dedicated GDDR3 video memory. Inspiron Zino HD alike Mac Mini desktop PC but added with Inspiron branding is 8-inch-by-8-inch nettop, which connects to the HDTVs with touch-based input for easier navigation with a new touch software interface that organizes shortcuts to touch programs. New quad-core AMD Phenom II X4 P920 processor along with up to 8GB DDR3 memory. Packed with Wi-Fi with 802.11n support, 2.1HD audio of up to 7.1THX suitable for real life-like movie experiences, multimedia card reader, four USB 2.0 ports, two eSATA ports, VGA port, HDMI port and LAN port. 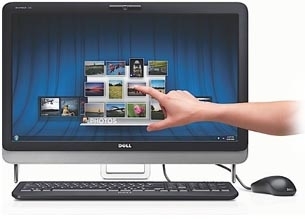 Touted to be mini powerhouse entertainment PC, this Inspiron Zino HD can be hooked to large screen HD TVs. 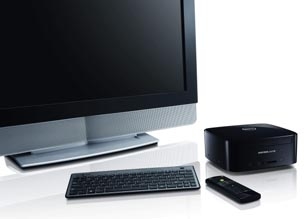 Dell offers wireless keyboard and Infrared Remote Control to enjoy TV or web surfing from anywhere in the living room.